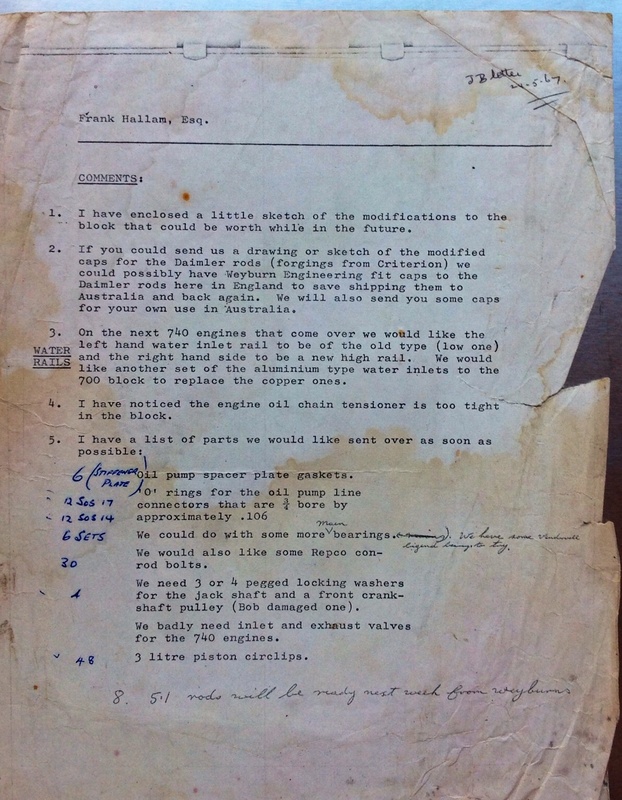 It would have been perfect if the song originated from 1967 given the date of the Brabham Racing Organisation team-leader’s (thaddl be Brabham JA) letter to the General Manager of Repco Brabham Engines Pty Ltd, Frank Hallam Esq is, according to Rodway Wolfe’s handwritten scrawl, 24 May 1967. These days we have that internet thingy which makes our lives so instant in terms of communication, back then it was ‘snail mail’ or Telex machine if you were from the big end of town. I guess airmail from Surrey, UK to Maidstone, Victoria, Australia was three days or thereabouts? And the same in return with a neato ‘Par Avion’ sticker and a more expensive stamp affixed. Jack’s note was sent between the Monaco and Dutch GP’s. 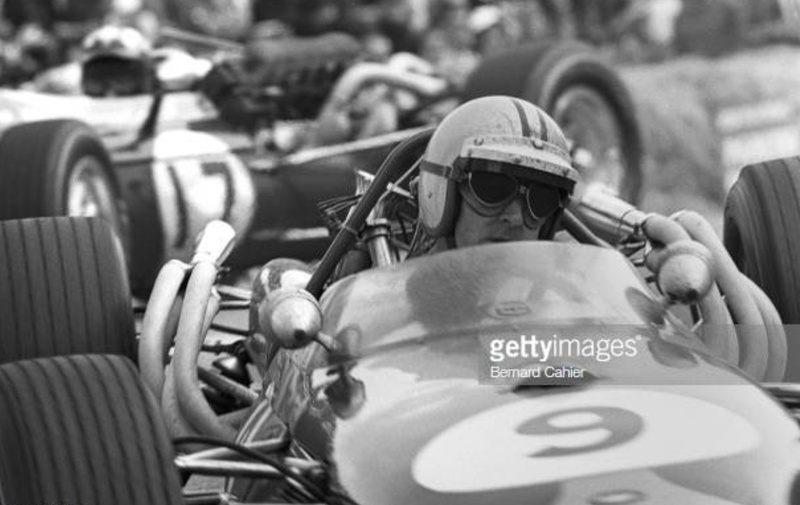 BRO had shown plenty of pace early in the season with Brabham and Hulme on pole and with fastest lap respectively at Kyalami albeit Pedro Rodriguez took the South African GP win in his Cooper T81 Maserati. At the following championship round- Monaco, Jack was on pole deploying the new RBE740 Series V8’s power and big, beefy mid-range punch for the first time in a championship round. But an unhappy early ending to the weekend was the Aussie’s new moteur breaking a rod on the first lap of the race. Denny won his first GP in a 620 engined BT20, so it was far from all bad from the team’s perspective- the race tragic for the sad demise of Lorenzo Bandini after a fiery crash aboard his Ferrari 312. But all the same their would have been a bit of consternation in the camp at the time, no doubt a phone call to Hallam was made about the buggered rod, or maybe Frank read about it in the late edition of Monday’s Melbourne daily ‘The Sun’? 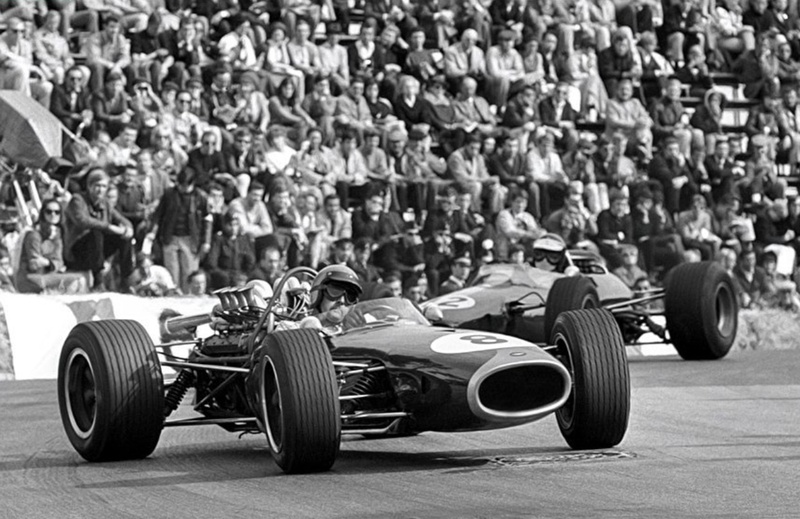 The Lotus 49 Ford Cosworth DFV changed the GP world when it appeared in the hands of Clark J and Hill G at Zandvoort on June 4- the need to lift was clear! So, lets address Jack’s requests. 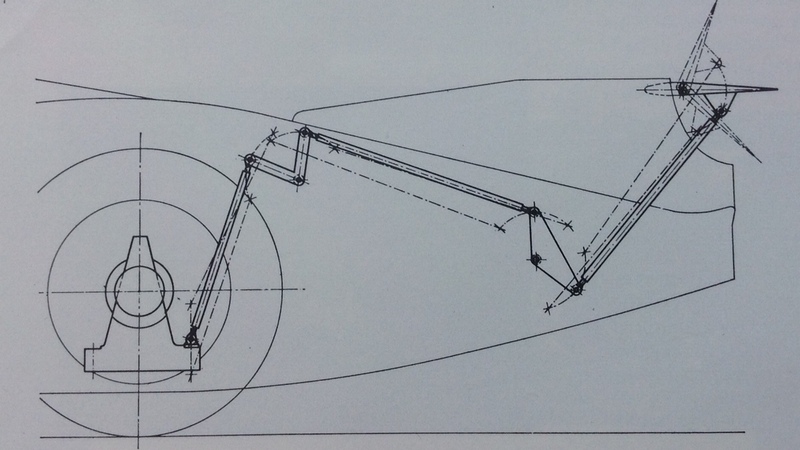 Sorry about that sketch of Brabham’s requested 700 Series block modifications! Sadly we don’t have it- which is a bumma. The modified Daimler rods and caps are RB620 bits, not 740- so Jack is after some bibs and bobs to keep alive some of the RB620’s by then in circulation in Europe. Not to forget Denny was still using RB620’s until he got a 740 for Spa in mid-June. The ‘620 Series’ Repco was the first of the Repco Brabham Engines series of race V8’s and was based on the standard Oldsmobile F85 block- ‘600 Series’ block and ’20 Series’ cross-flow heads in Repco nomenclature. The ‘740 Series’ was the new for 1967 motor- ‘700 Series’ bespoke Repco designed block and ’40 Series’ exhaust within the Vee heads. The water rail changes appear routine race experience evolution, in fact whilst the whole letter is dealing with normal stuff its still interesting, if you know what i mean? And the engine fitters will have been given the bief to watch the chain tensioner fit. Jack’s checklist of engine parts is interesting. I thought all of the RBE engine rebuilds happened at Maidstone but clearly that is not the case, some engine work was being done in The Land of The Pom. Interested to hear from you RBE lads on this point. 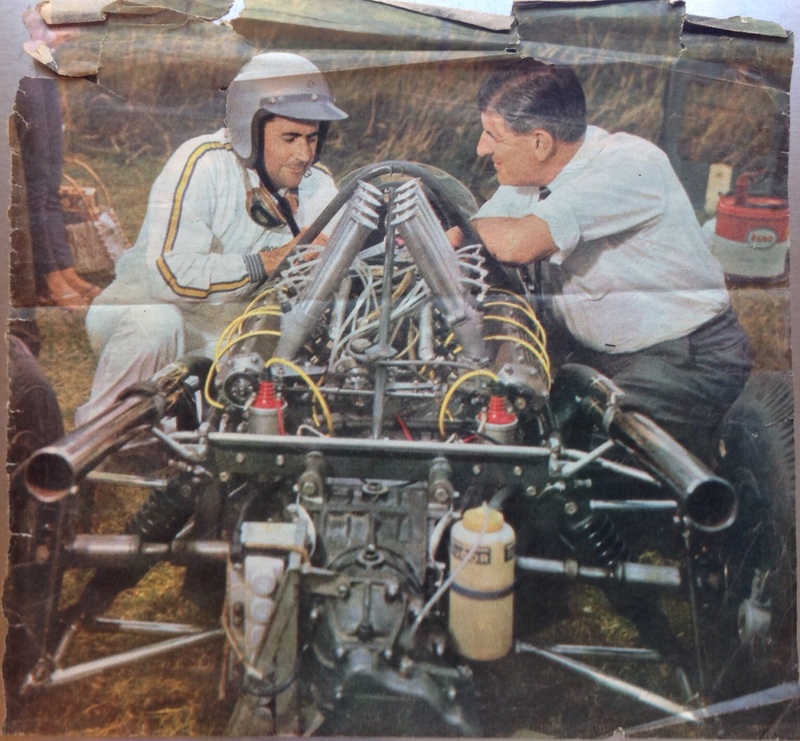 The photograph above is of the two participants in the above correspondence at Sandown Park, Melbourne during the 1966 Tasman round. It is a ‘pose for the press’ shot given the race debut of the Repco V8 in the companies home town. It was the second race for the RBE620 Series V8- the first was a 3 litre unit used by Jack during the non-championship South African GP weekend on 1 January, DNF with a fuel injection pump problem. 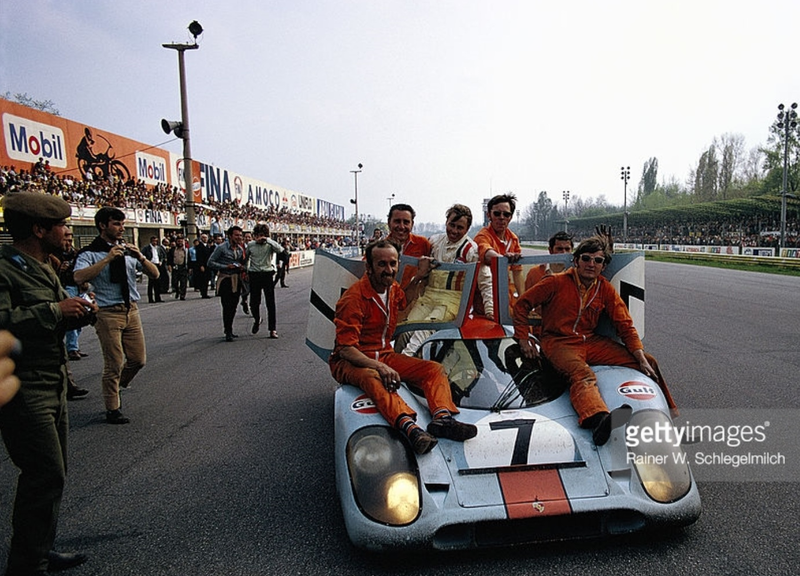 There was only one Porsche 917 amongst the first nine cars home at the duration of the Monza endurance classic on 25 April but the German flat-12 was first, Pedro Rodriguez and Leo Kinnunen were happy winners. Three Ferrari 512S followed them home, the Ignazio Giunti/Nino Vaccarella/Chris Amon Spyder 1.5 minutes adrift of the John Wyer Porsche. It wasn’t a happy season for Ferrari in sportscars. Supremely competitive in F1 with the first of its flat-12 engined cars, the 312B, the 5 litre V12 512S really didn’t receive the development it needed to knock off the Porsches. The German cars mainly raced at 4.5 litres in capacity that year but it was still more than enough. A win at Sebring in the second round of the Manufacturers Championship was Ferrari’s best result, and the flat-8 3 litre, nimble, light Porsche 908/3 mopped up on the tight, twisty circuits unsuited to the 917. The dudes from Stuttgart had the game well covered. The speed of Ferrari’s evolved 512S, the 512M was clear at the Osterreichring 1000 Km in October, so 1971 looked to be a great battle of two amazing 5 litre cars but effectively the Scuderia waved a white surrender flag before the seasons commencement. 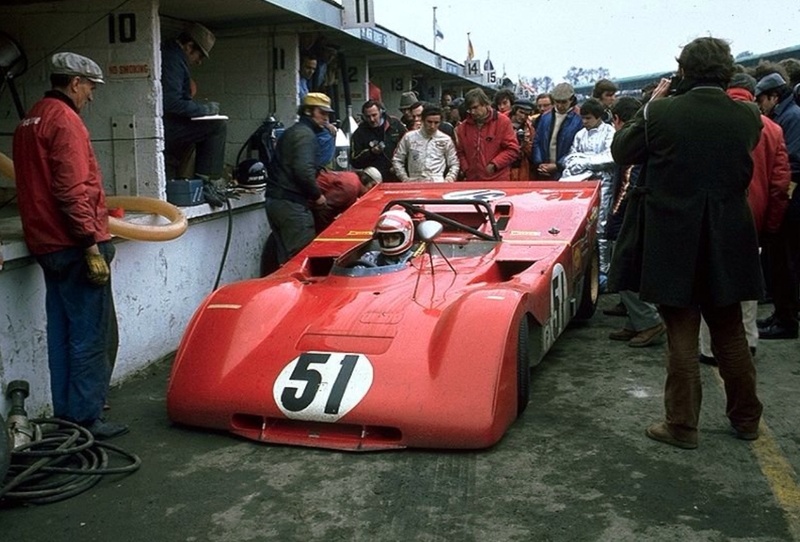 They chose to race a new 3 litre flat-12 engined prototype, the 312P in 1971 with an eye to the rule change to cars of that capacity in 1972, rather than the factory race the 512M. The Ferrari privateers did their best against the Panzers but it was ineffective, the speed of the beautifully prepared and superbly Mark Donohue driven Penske 512M duly noted. 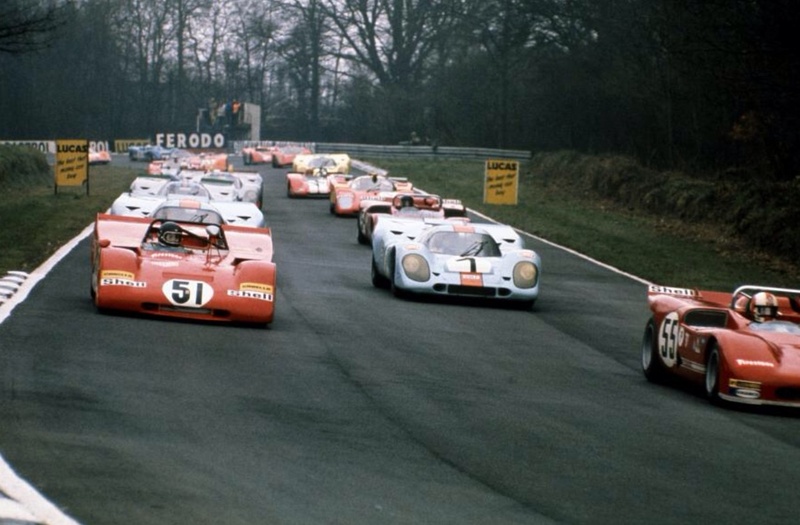 The 1971 endurance season could have been the greatest ever had Scuderia Ferrari raced those cars! 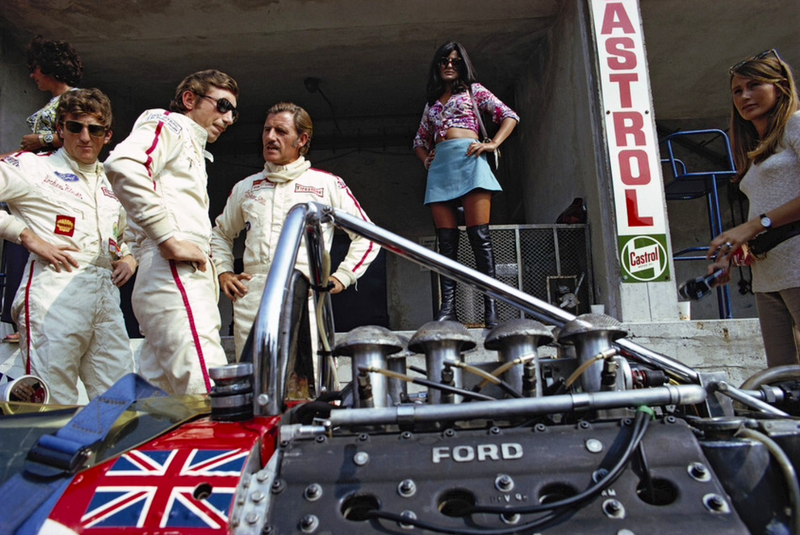 Back to Monza 1970. 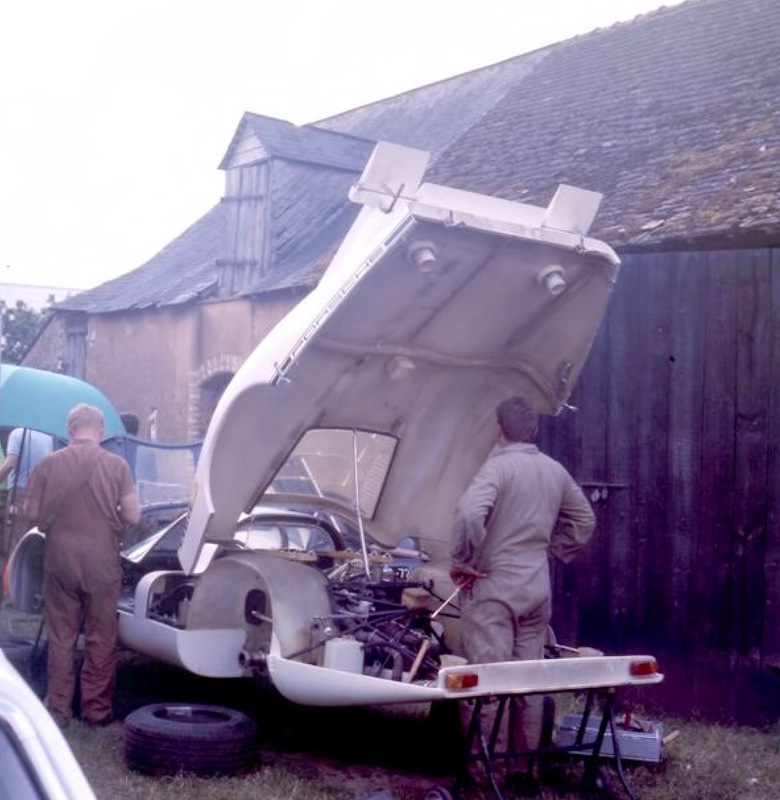 The other ‘works’ Porsches were well back- the JW 917K of Jo Siffert and Brian Redman finished 12th, the Porsche Salzburg 917K’s of Vic Elford/Kurt Ahrens DNF with puncture damage after 92 laps and the 1970 Le Mans winning combo of Hans Hermann and Richard Attwood were out with engine failure on lap 63. 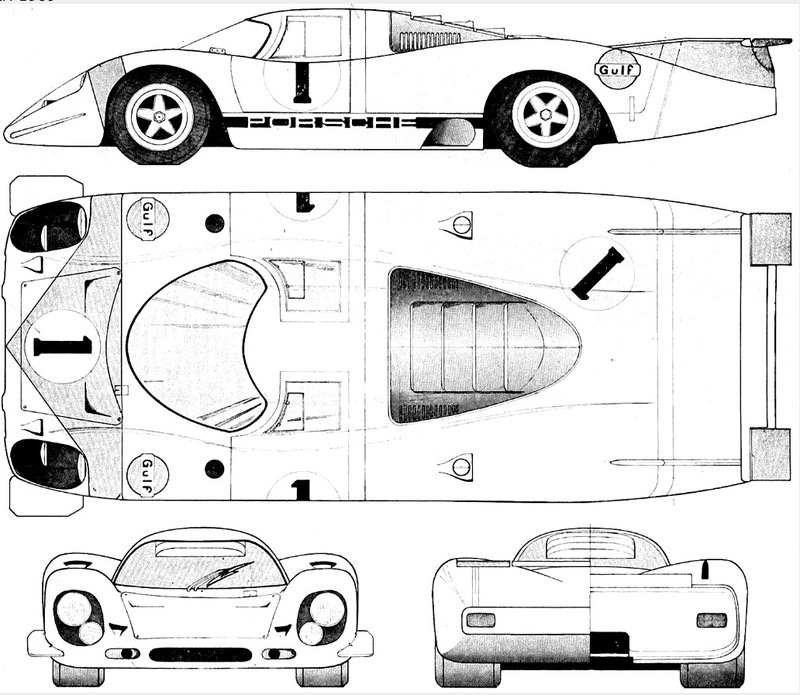 The Porsche 917 was a tricky, somewhat under-developed beast in its original specification even for experienced professionals. British privateer John Woolfe lost control of his on the first lap of the ’69 race perishing in the subsequent accident. 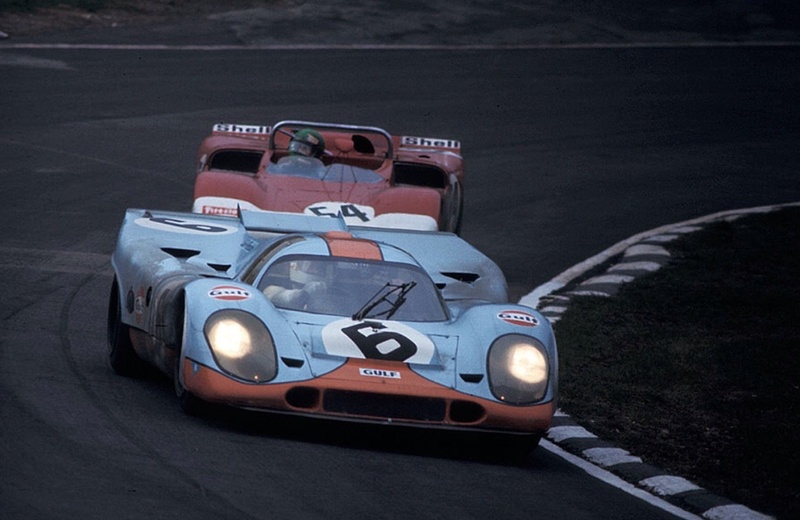 Despite that, a 917 took pole and lead the race for 20 Hours, maybe its been somewhat maligned in its formative year? 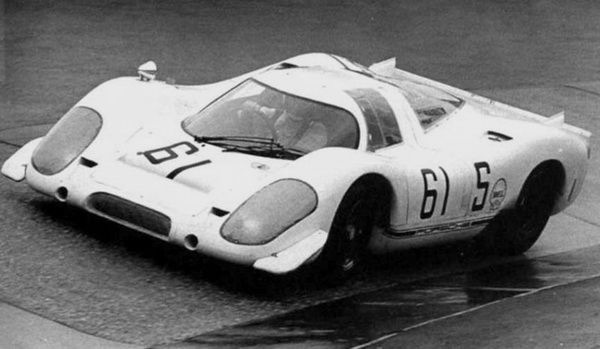 By 1967 the Commission Sportive Internationale (CSI) were concerned about the growing speeds of the unlimited ‘pushrod production’ 7 litre Ford GT Mk4 and Chaparral 2F, and the 4 litre ‘racing engine’ Ferrari P4 and banned them. It did so by increasing the required number of cars to be built and lowered engine capacity limits for homologation, or admission of cars into both classes. 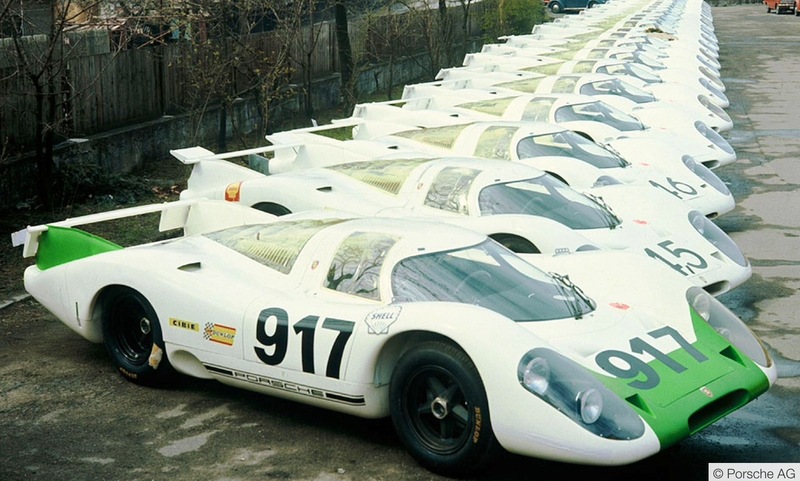 For 1969 there were no minimum production numbers to qualify in Group 6 ‘3 litre Prototypes’ with a minimum of 25 cars to be built for homologation into Group 5 ‘5 litre Sports Cars’. Effectively this allowed the existing Mark 1 Ford GT40 and Lola T70 Mk3B cars to reamin eligible to keep grid sizes up, but with the hope or intent that 3 litre prototypes would be built in large numbers, Formula 1 having the same capacity limit at the time. 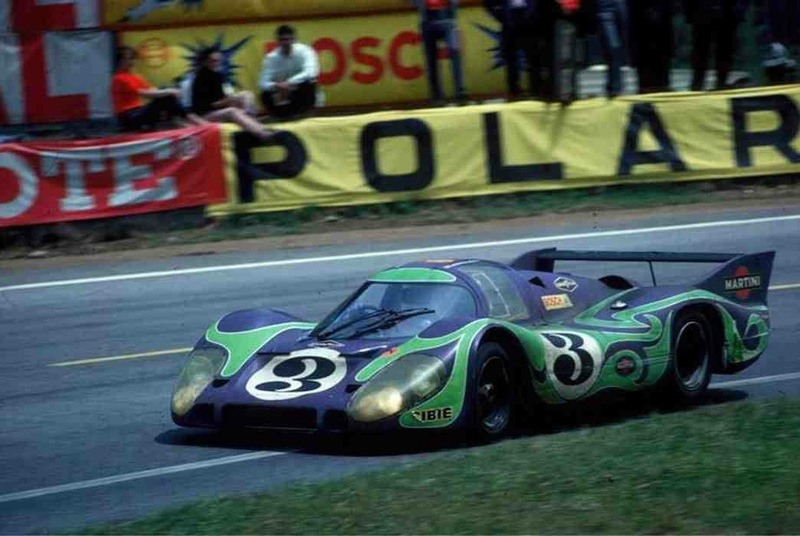 The FIA, as the governing body by then was, had another crack at rewriting the rules to encourage 3 Litre prototypes with effect 1 January 1972 given the speed of the 5 litre Porsche 917 and Ferrari 512S in 1970 and 1971 but that is another story- lets not get ahead of ourselves. 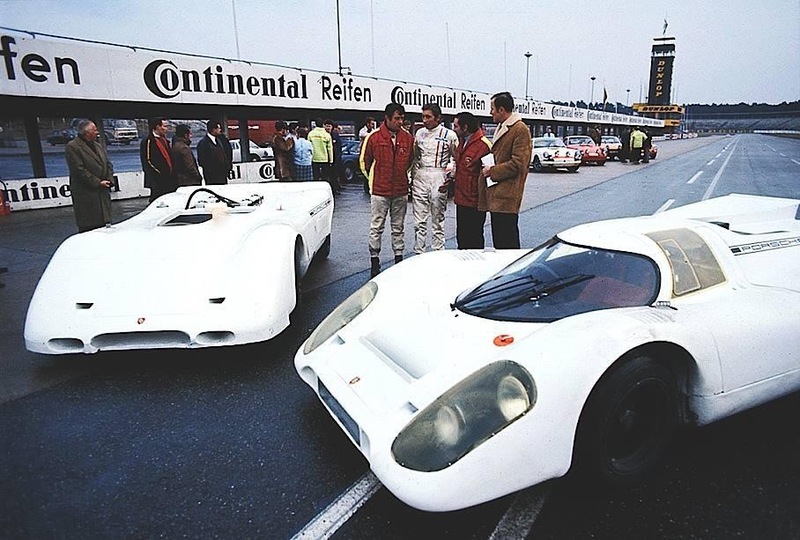 Porsche had come close to Le Mans victory with their ‘class cars’ and wanted to win outright, to do so they audaciously built twenty-five 4.5 litre air-cooled Flat 12 engined cars, the 917 in 1969. 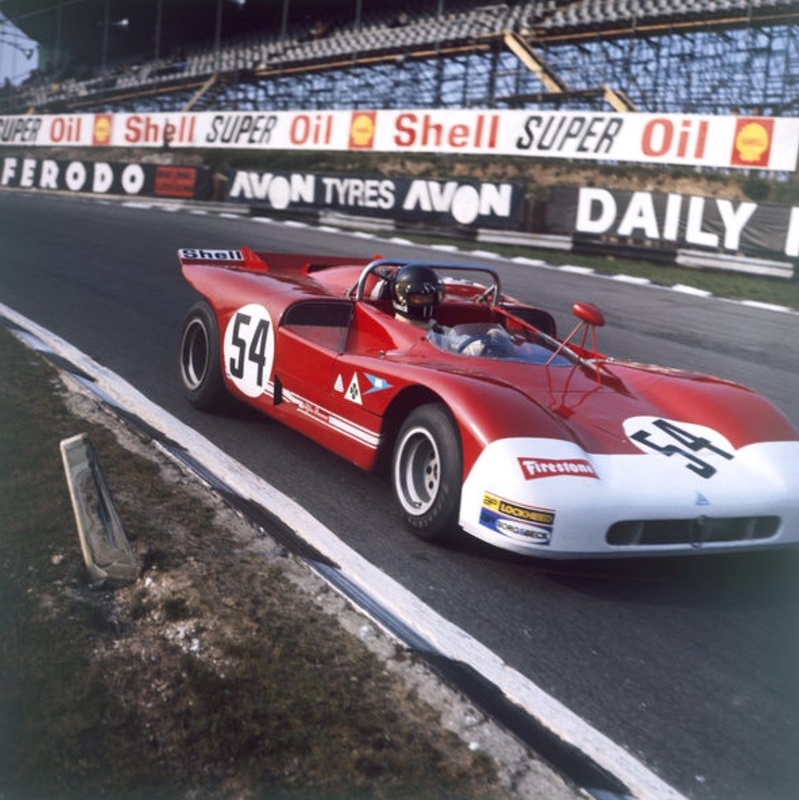 Having thrown down the gauntlet, Ferrari, with his coffers full of Fiat money- having sold his road car division to them in 1969, built twenty-five 5 litre V12 512S to go head to head with Porsche in perhaps the two best years of sports car racing ever, 1970 and 1971. 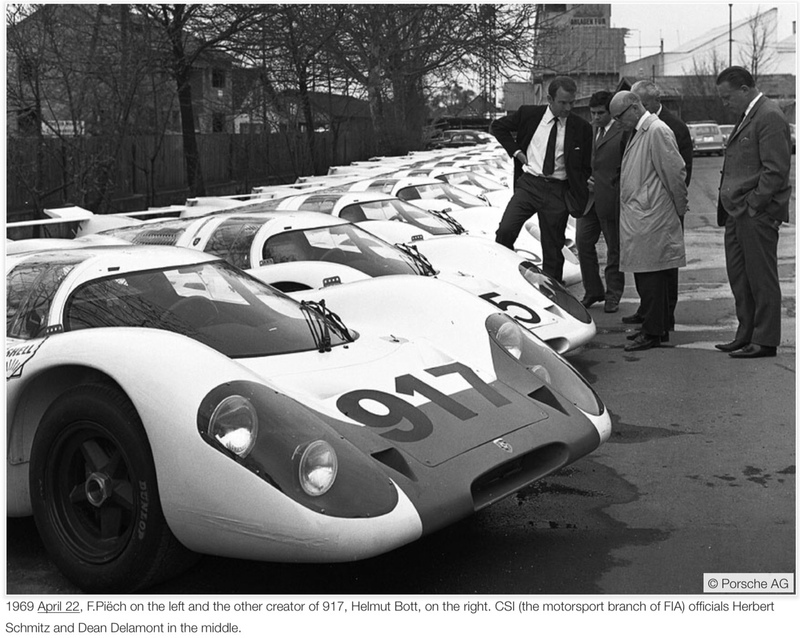 On 12 March 1969 a 917 was displayed at the Geneva Motor show with a price tag of DM140,000 a fraction of the cars development costs. 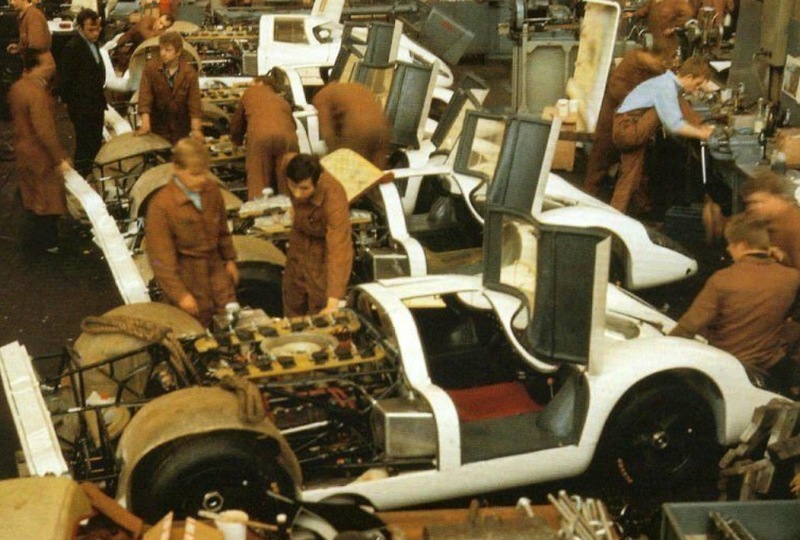 The cars above were displayed for inspection at the factory to the CSI on 20 April, Ferdinand Piech cheekily offered the CSI inspectors the opportunity to drive any of the machines to prove they were complete and running, the offer was declined. 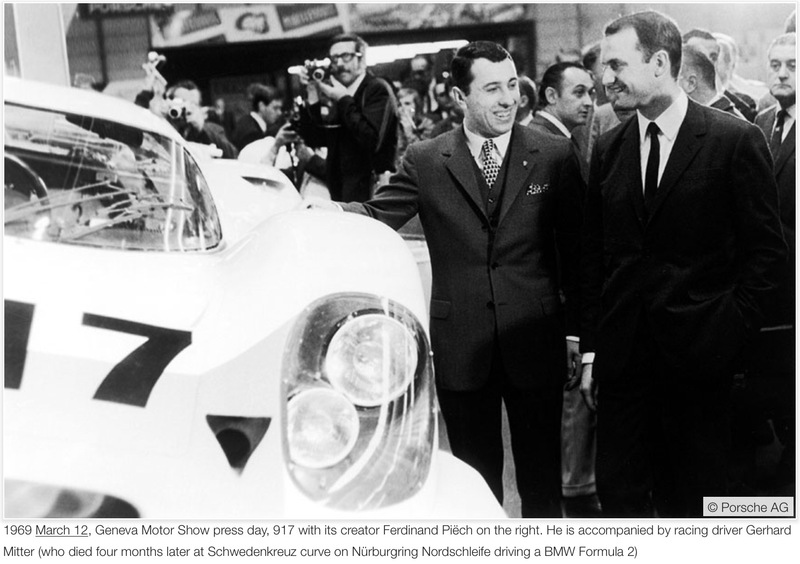 Engineer Ferry Piech said that Porsche would not have built the 3 litre 908 had they known the CSI’s intent in relation to the 5 litre Group. 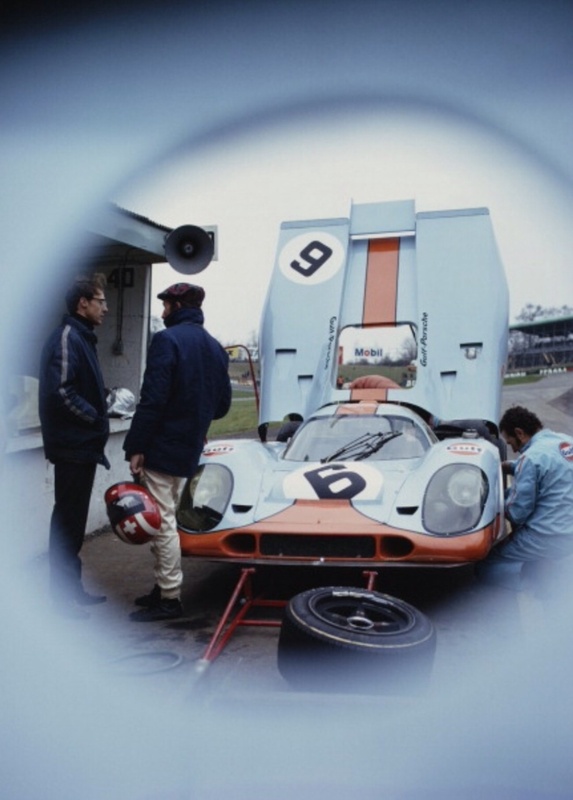 At the time they built the 908, a Group 6 car, the minimum production number for homologation into Group 5 was 50 cars not 25, so he can be somewhat forgiven for not being able to read the minds of the rule-makers, then as now unpredictable. 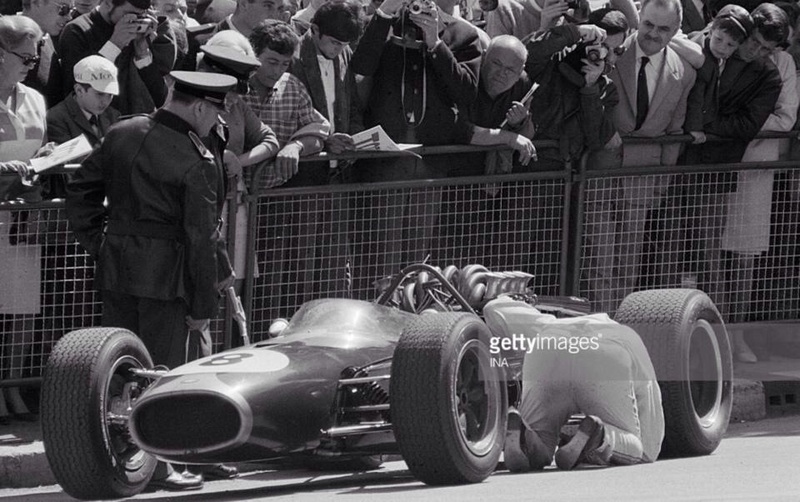 The regime of rules was not about encouraging 5 litre cars with ‘racing’ as against ‘production’ based engines. So Porsche surprised everyone- until then they had built class contenders rather than outright cars, and even then it was not thought possible to build a 5 litre air-cooled engine, to that time a Porsche specialty. Water cooled Porsches were not to appear for nearly a decade. 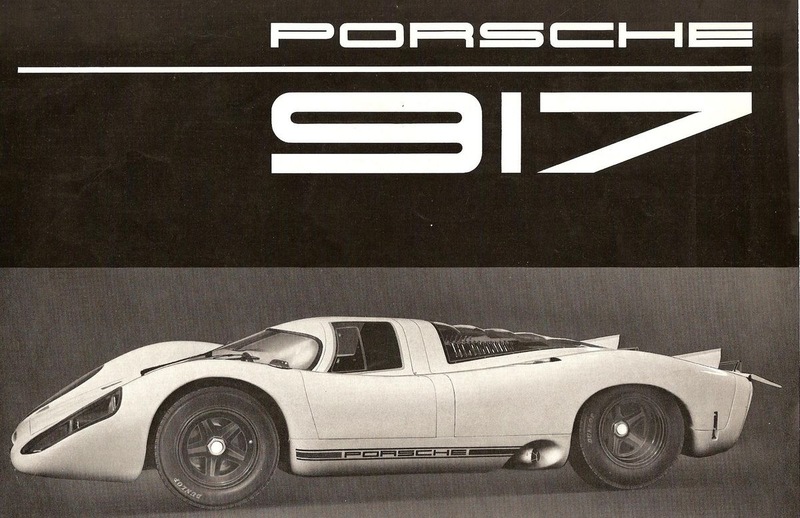 Work started on the design of the 917 in July 1968, Porsche were convinced they could build a car down to the class minimum weight limit of 800 Kg based on the 908 which was 300 lbs lighter than their Alfa, Matra and Ferrari 3 litre rivals. 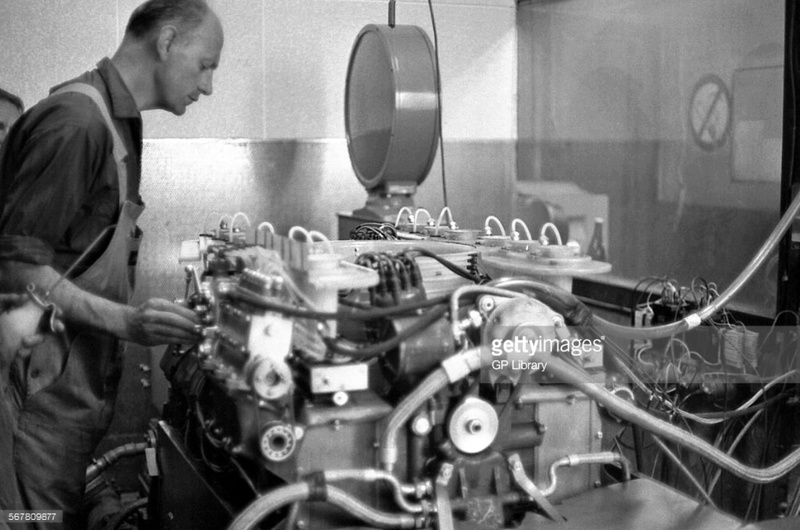 To speed up the development of the 917 engine the same reciprocating parts, bore, stroke, valve and port sizes of the 908 engine were used…giving a capacity of 4494cc with a bore and stroke of 85 X 66mm. Porsche believed initially at least it wouldn’t be necessary to build a car to the full, allowable 5 litre limit to dominate. All the fuel injection and valve timing settings were taken over from the 908 albeit the valve angle differed to allow cooling air passages between the valves. Four valves per cylinder was never an option for this reason. Apart from the above the flat 12 is an entirely different engine to the 3 litre flat 8. A long crankshaft did not allow anything other than a central power take off to avoid catastrophic torsional vibrations. 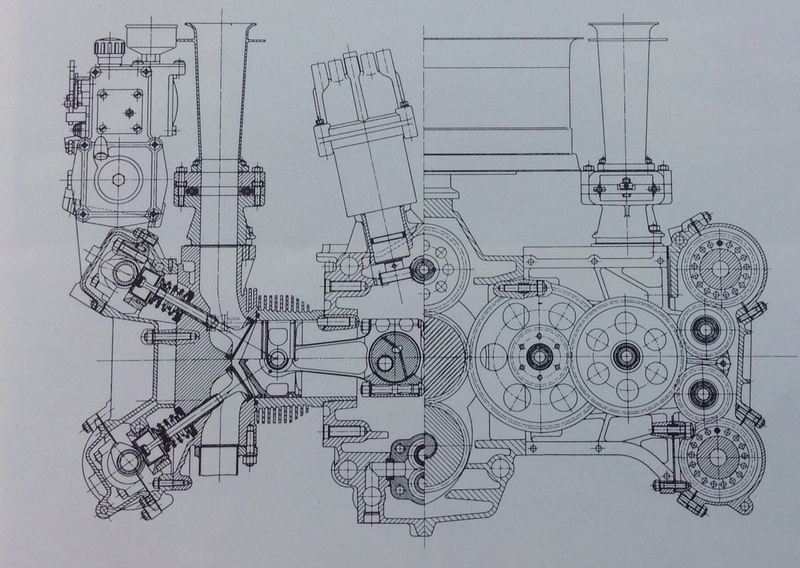 The long crank hence became effectively two shorter cranks joined together at their flywheels, which were just a gear in mesh with another on the output shaft running parallel to, and under the crankshaft which ran on 8 main bearings. The power output shaft drives the triple gear type oil pump with 4 additional small oil pumps driven by the exhaust camshafts. Another shaft running symmetrically with the crank drives the 2 distributors of the electronic ignition, the Bosch fuel injection pump being driven off the left hand exhaust camshaft. The engine had few steel or iron parts- the crankcase, cam covers and timing gear case were magnesium. 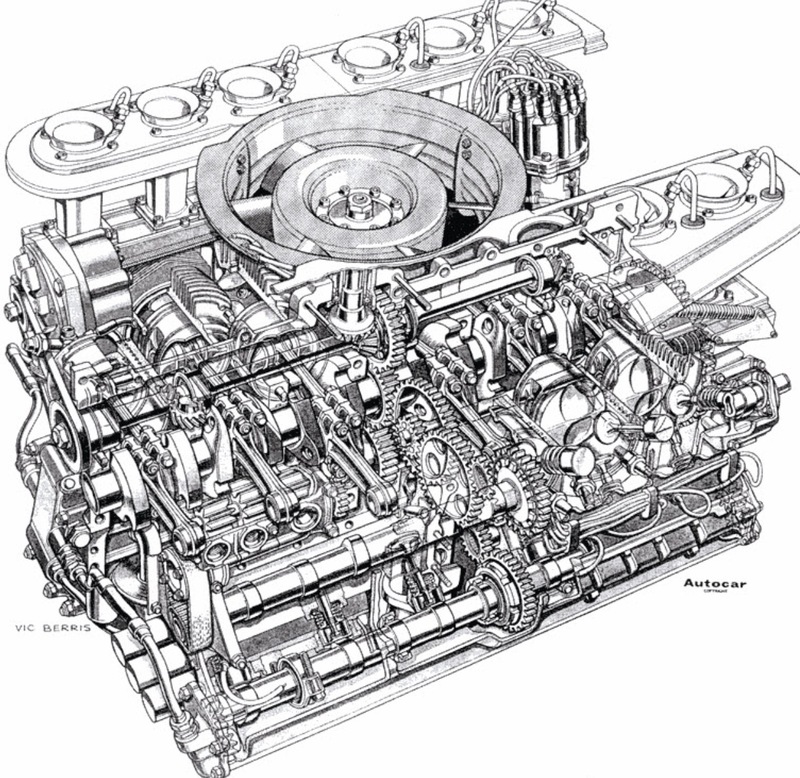 The heads and cylinders were aluminium with titanium used for conrods, auxiliary drive shafts, the main output shaft and later in the engines development, valves and valve springs. The cooling blower and most of the air ducts were plastic. The 4.5 litre engine weighed 528lb in original form and developed 542bhp on its first dyno run, this rose to 580bhp @ 8400 by the time the car arrived at Le Mans in 1969. A new gearbox was built to take 376lb ft of torque, the case was magnesium, used Porsche synchromeshand a wet sump incorporating a ZF ‘slippery diff’ with 75% locking factor. 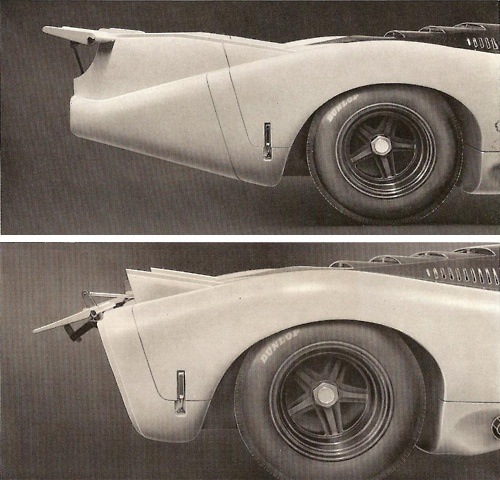 The chassis was largely that of the 908…suitably reinforced, the spaceframe was welded aluminium tube. Note that later in the program three chassis’ were built of magnesium. The wheelbase was 90 inches and track in 1969 58.8 inches at the front and 60.4 inches at the rear. 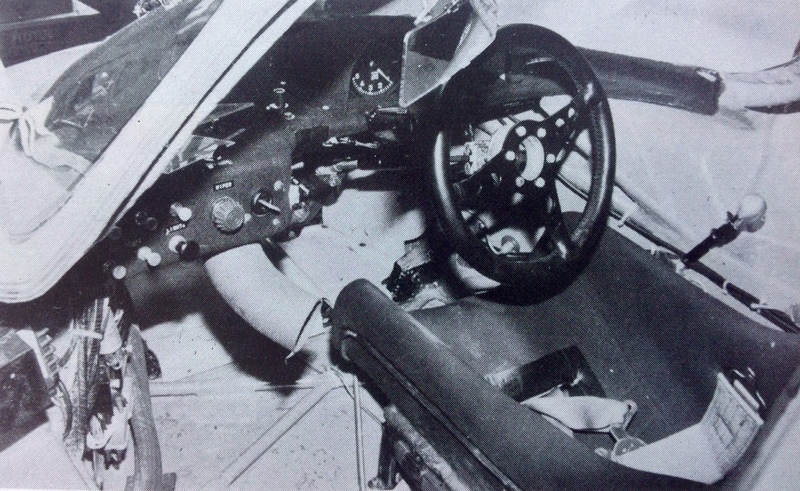 As with all Porsche racing cars the frame had to withstand 600 miles of hard driving on the Weissach ‘Destruction Course’ but even so a tyre valve was incorporated into the 103lb frame to allow it to be ‘inflated’, a loss of pressure indicative of chassis cracks- sub-optimal in a car of this performance! Again, magnesium, aluminium and titanium parts were widely used for the running gear- titanium for spherical joints, hubs, springs, the gear lever and steering column. Magnesium was used for the uprights and wheels and aluminium for the steering rack, this obsessive approach to weight saving ensured the car tipped the scales at less than 800kg. 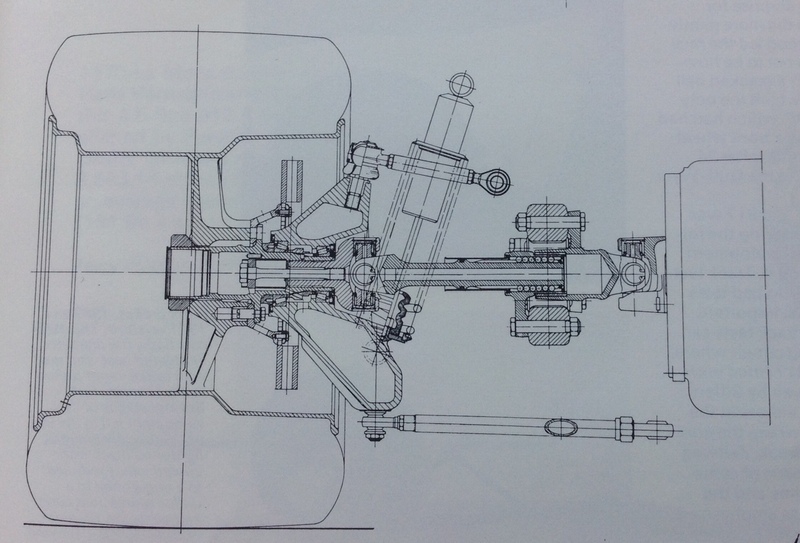 The suspension geometry was the same as the 908…but incorporated anti dive geometry by angling the upper and lower wishbone pivots to each other. Wishbones were used at the front with coil spring/damper units and an adjustable sway bar. At the rear a single top link and lower inverted wishbone was used. Radius rods provided fore and aft location, and again coil spring/damper units were used and an adjustable sway bar. Bilstein provided the shock absorbers. Initially 9×15 front, and 12×15 inch magnesium alloy wheels were used, with a single centre aluminium lock nut, the same as the 908. The suspension was largely set up at the Nurburgring- long suspension travel, plenty of camber change and tyres of a rounded tread section were necessary for performance there. This did not translate at other circuits where the car was ‘under-tyred’ and the geometry unsuitable as well. More of this later in the article. Brakes in 1969 were ATE aluminium calipers operating on cast iron ventilated rotors/discs. Both short and long tails and were interchangeable, with the latter 236mph on the Mulsanne Straight was reached in 1969. The ’69 bodies were fibreglass which were bonded to the chassis and incorporated two seats and doors. Stability of the cars was critical, front spoilers were fitted and a ingenious setup of mobile rear flaps connected with the rear suspension in such a way that if the suspension was compressed the flaps would create an aerodynamic force to raise the tail whilst if the suspension was extended, the flaps would angle up to push the tail down. 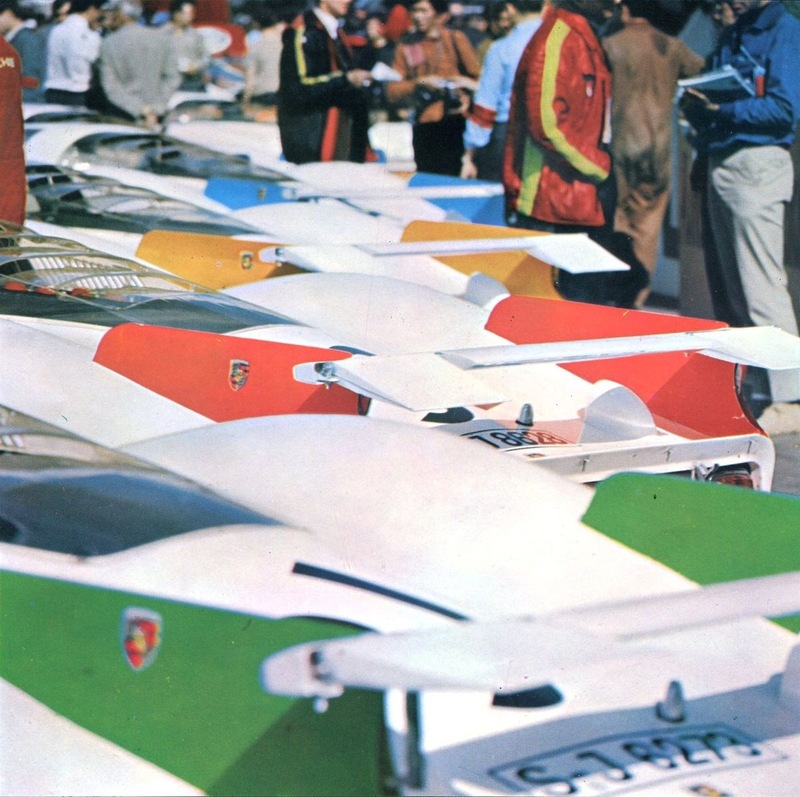 In 1969 these appendages caused major dramas, as only two weeks before Le Mans the FIA banned ‘movable aerodynamic devices’ on all racing cars, a consequence of many wing failures in F1. 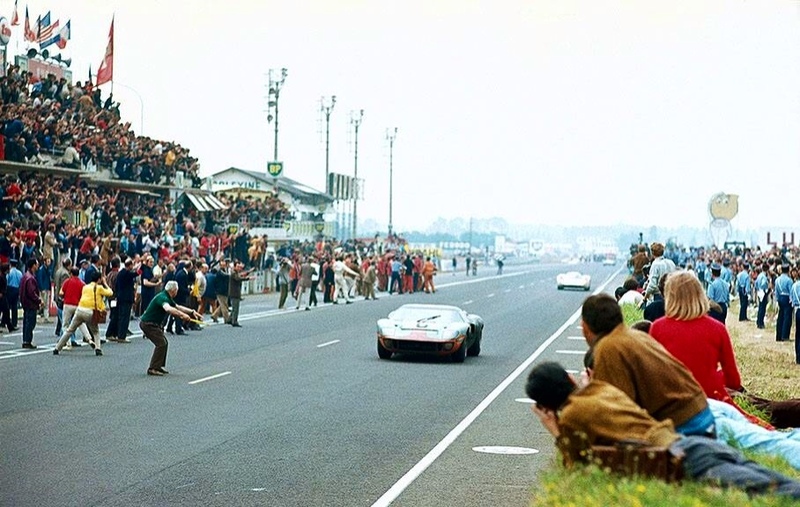 As the 917 was almost undrivable without the flaps with which it was designed and homologated, the cars were allowed to race at Le Mans but the devices had to removed thereafter. 25 sets had been made to comply with homologation requirements but only 2 or 3 were used! 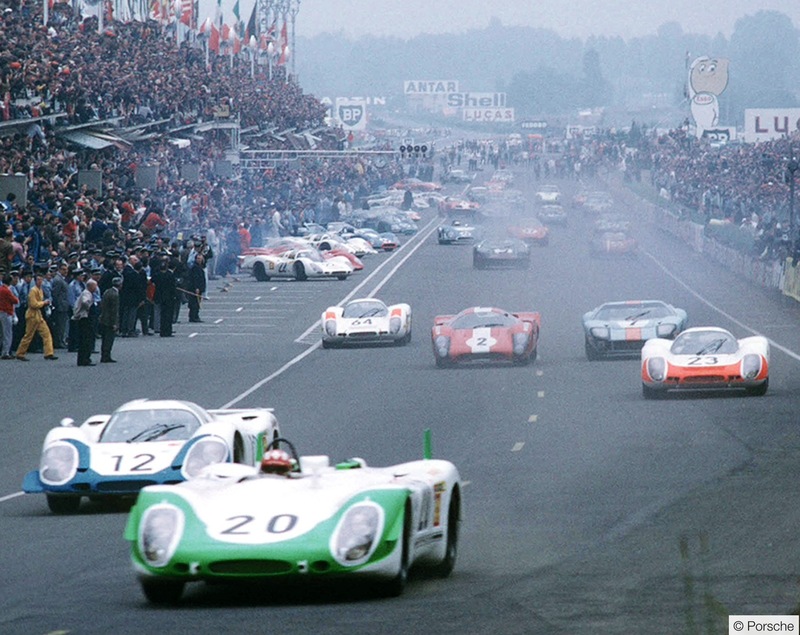 The traditional Le Mans test weekend took place on the weekend of April 4 1969, the 917 making its public circuit debut. Rolf Stommelen drove the car and achieved a speed quicker then the 908LH, (LH is ‘Langheck’ or Long Tail) on paper the car had potential but the handling and levels of stability were frightening. After little testing, two cars were entered for the Spa 1000Km in May. 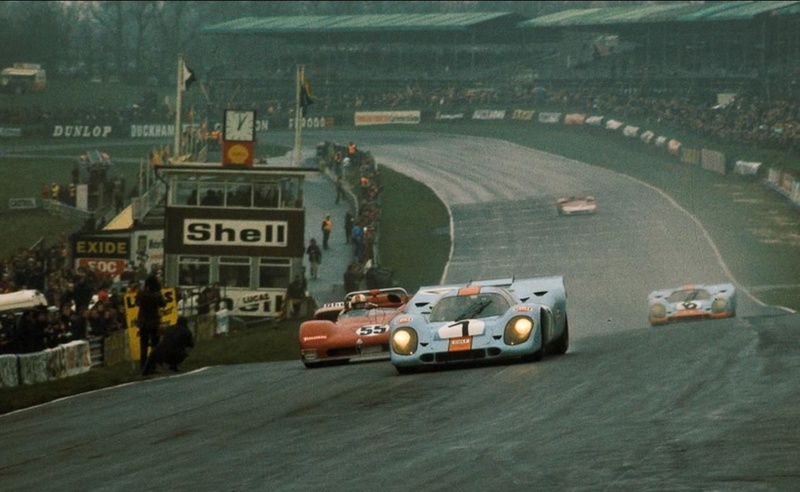 Jo Siffert and Brian Redman tested their 917 but chose to race a 908 and won the event from Pedro Rodriguez/Chris Amon in a Ferrari 312P and Vic Elford/Kurt Ahrens in another 908. Gerhard Mitter started his 917, having qualified 8th but retired with engine failure on lap 1 having possibly over-revved the engine at the start. 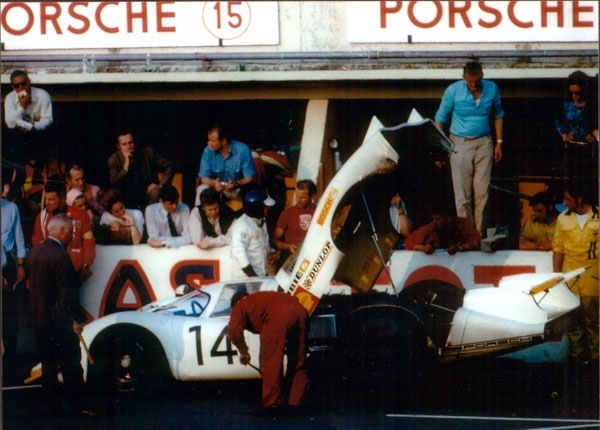 The 917’s were experiencing high speed instability, the very reason Siffert elected to race a 908LH. 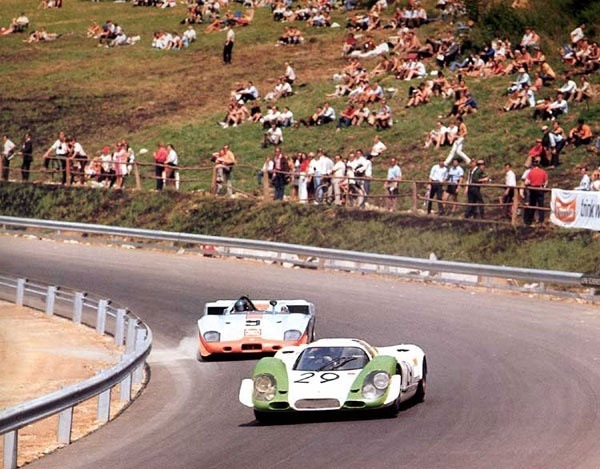 Mitter and Udo Schutz won the next event, Targa in a 908, their were no 917’s entered on a circuit totally unsuited to them. 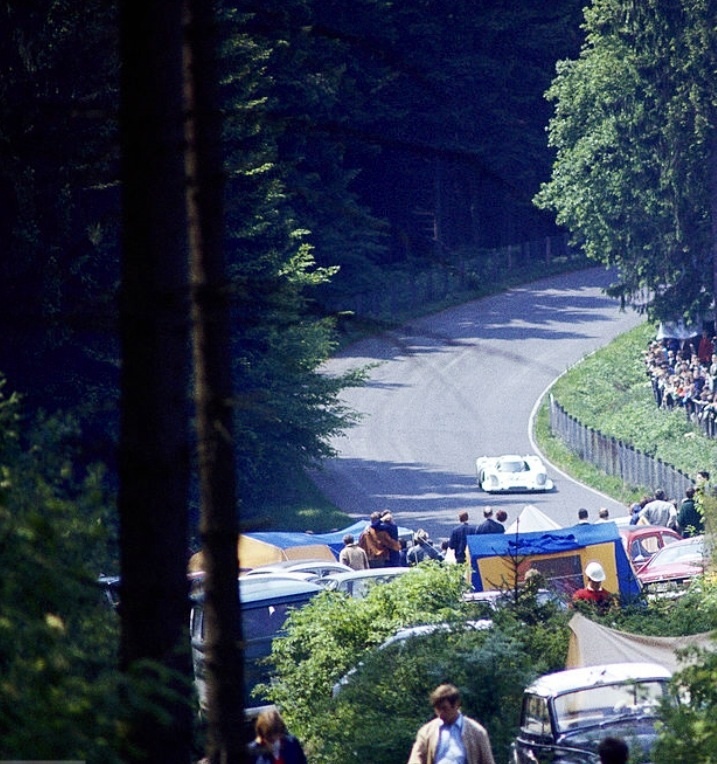 For Porsches’ home event, the Nurburgring 1000Km on 1 June they hired two hardened sports car professionals in Frank Gardner and David Piper to ‘bring the thing home’- that they did in 8th place having wrestled the unruly beast around 44 laps of the ‘Green Hell’, the Nurburgring. 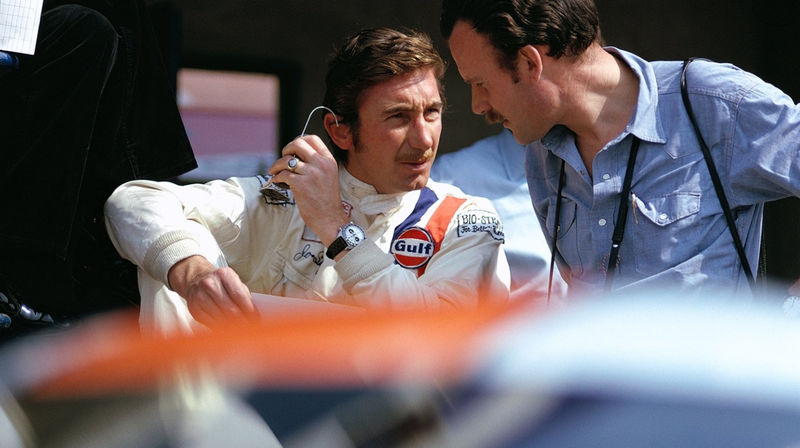 Gardner was a noted test and development driver, Porsche were keen to get his views on changes to make the car competitive. 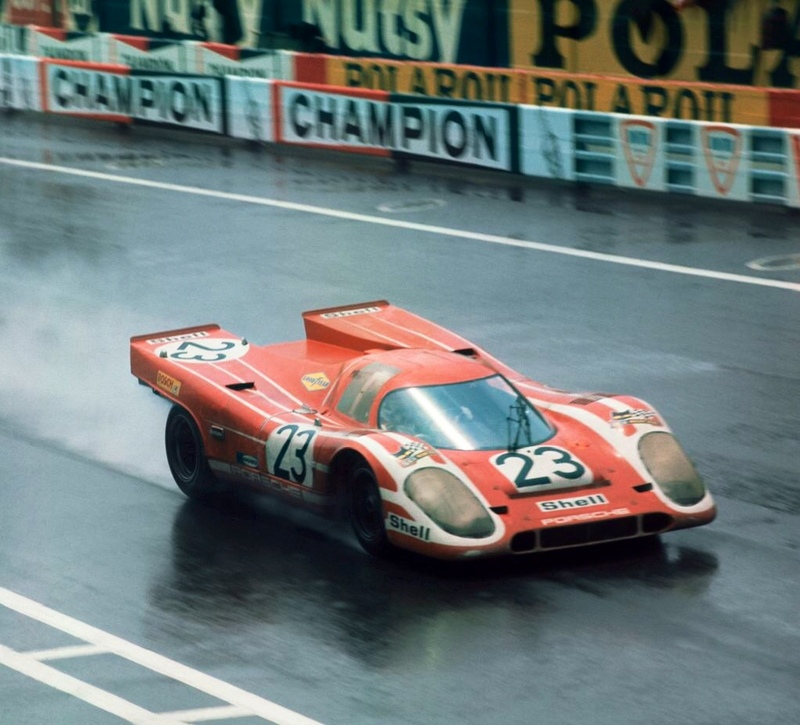 The race was won by Siffert/Redman in a 3 litre 908 ahead of two other 908’s. 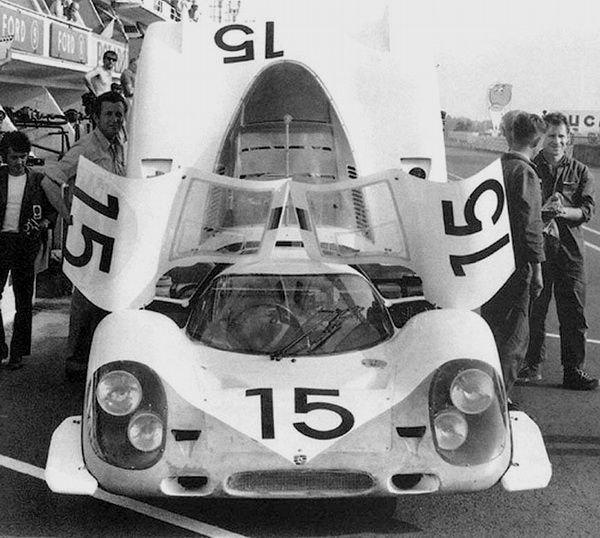 Other than more power, 580bhp and with the anti-dive geometry of the suspension reduced from 50% to 5% the 917 arrived at Le Mans as designed. Fortunately, as described above the cars were able to race with their adjustable rear wings. Commonsense prevailed from a safety perspective. 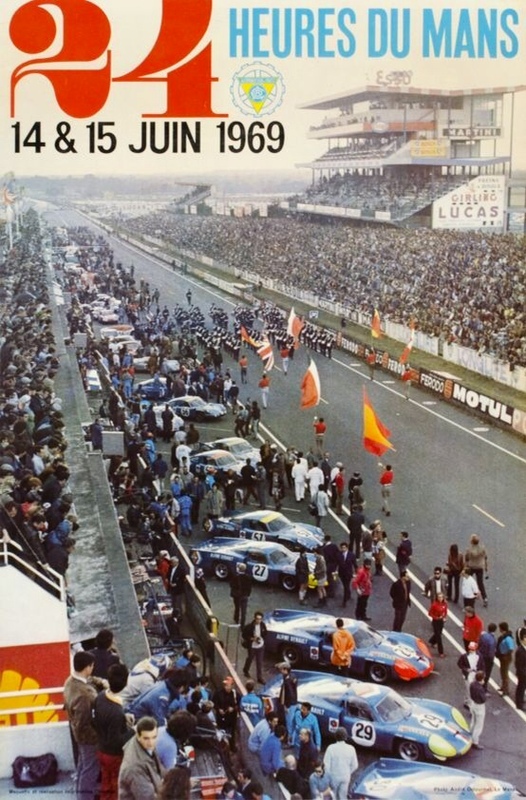 At Le Mans Porsche famously, very narrowly lost the race, the Herrmann/Larrouse 908LH being just beaten by the Ford GT40 of the ‘two Jackys’, Ickx and Oliver, winning in chassis ‘1075’ the same JW Automotive GT40 which was victorious the year before. 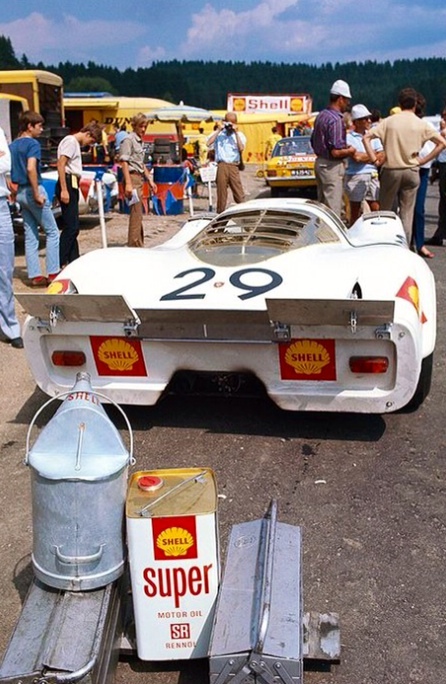 Rolf Stommelen put his 917 on pole, outlining the cars potential but the car failed on lap 148 with an oil leak. 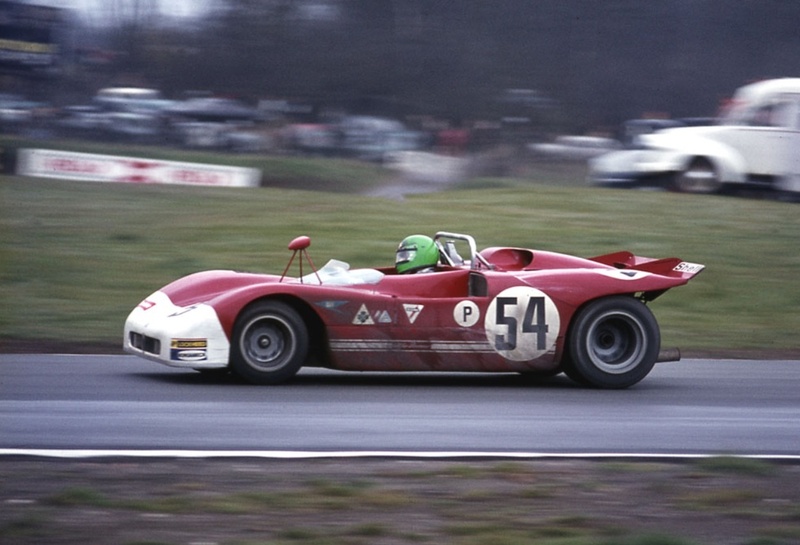 Vic Elford qualified his car second, co-driven by Richard Attwood, the car led the race for 20 hours and did 327 laps- enough for 9th place, the car was not running at the finish having withdrawn with a cracked bellhousing. 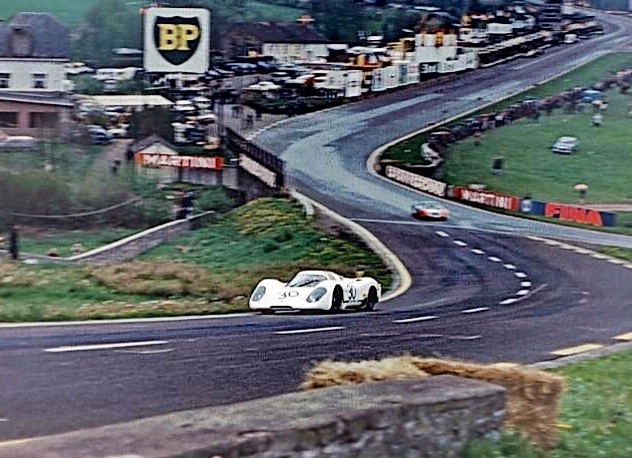 The First Win, Osterreichring 1000Km 1969..
Porsche did not take the 917 to Watkins Glen but were victorious again, Siffert and Redman winning in a 908 from another two 908’s. 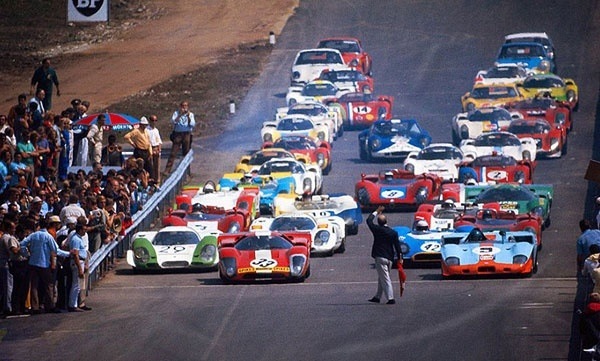 The Osterreichring was the last round of the Manufacturers Championship in 1969 and a fast track, 130 mph average, well suited to the 917’s qualities. 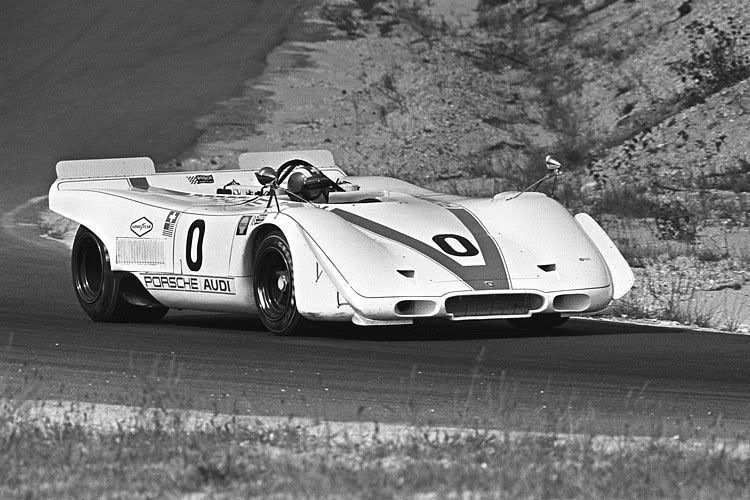 And so it was that a factory 917 driven by Siffert/Ahrens beat Jo Bonnier/Herbie Muller in a Lola T70Mk3b Chev from Richard Attwood and Brian Redman in David Pipers 917K with Masten Gregory and Richard Brostrom 4th in the first of the 908’s. It wasn’t the strongest round in terms of depth of entry of the 1969 championship but a win all the same. 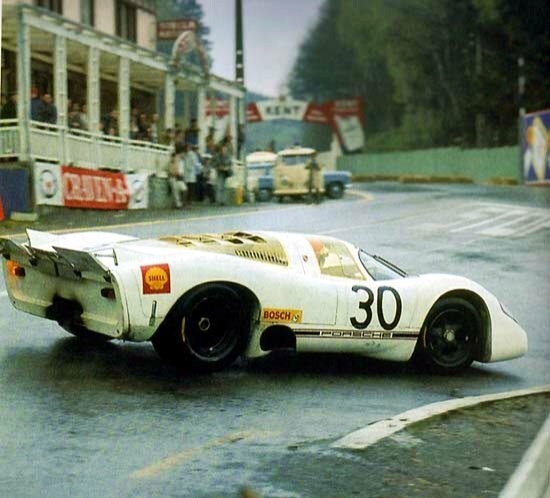 Whilst a short tail 917K won the Austrian 1000Km race against weak opposition, other than at Le Mans the cars were still uncompetitive. A mix of track, skid pad and wind-tunnel tests improved the car. The team stayed on in Austria to test improvements to the car after its victory. 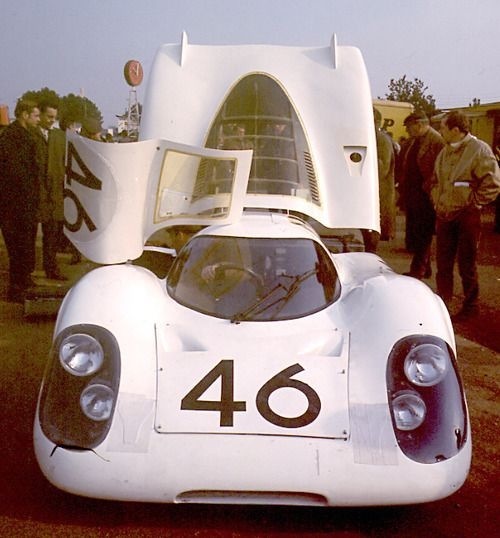 The 917 was modified in its aerodynamics by having the waistline of its doors raised and raising the tail to give the car more of a wedge shape. The changes increased drag but critically improved downforce and stability, the rear flaps now long gone. The aero changes were partially attributable to JW Automotive, who were to race the car on behalf of the factory the following year, the aero changes alone improving lap times by 4 seconds per lap at the Osterreichring. Testing showed that wider wheels and tyres were quicker, as were stiffer springs, however the suspension geometry itself was unchanged. The engine was largely as was albeit the exhausts now exited at the rear whereas at first the front cylinders gasses had exited via the doors. The Fichtel and Sachs clutch was replaced by a triple plate Borg and Beck item and the gearbox and clutch housing was reinforced to avoid the failures experienced at Le Mans. 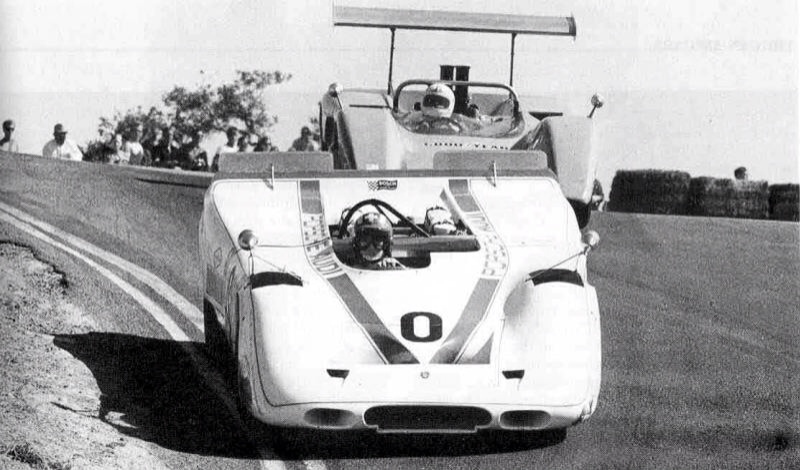 To further test some of the changes made, an open car was built, designated the 917PA (PA ‘Porsche Audi’ the US importer of Porsche) for Jo Siffert to drive in the 1969 Can-Am series, late that year. 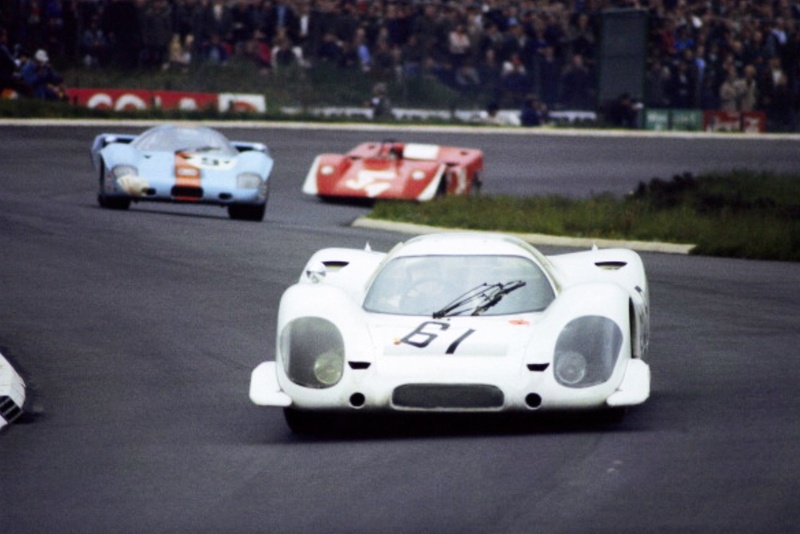 The 917PA competed in six races with its best results a second and a third, the car was ‘blown away’ by the 7 and 8 litre Chevs, Bruce McLaren and Denny Hulme were dominant in their McLaren M8B Chevs. 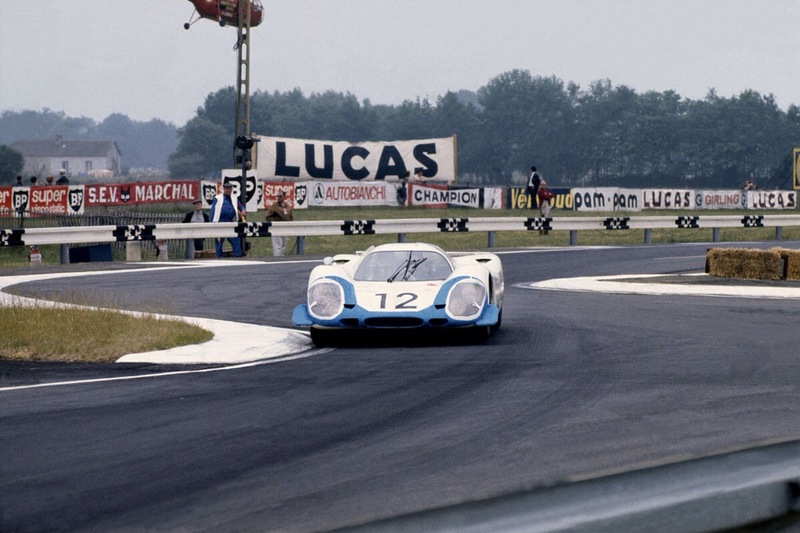 Valuable experience was gained for the 1970 Manufacturers Championship as well as another tilt at the Can-Am series and information which would prove useful for Porsches’ successful assault on the Can-Am championship in 1972 and 1973 with the awesome, turbo-charged 917/10 and 917/30. 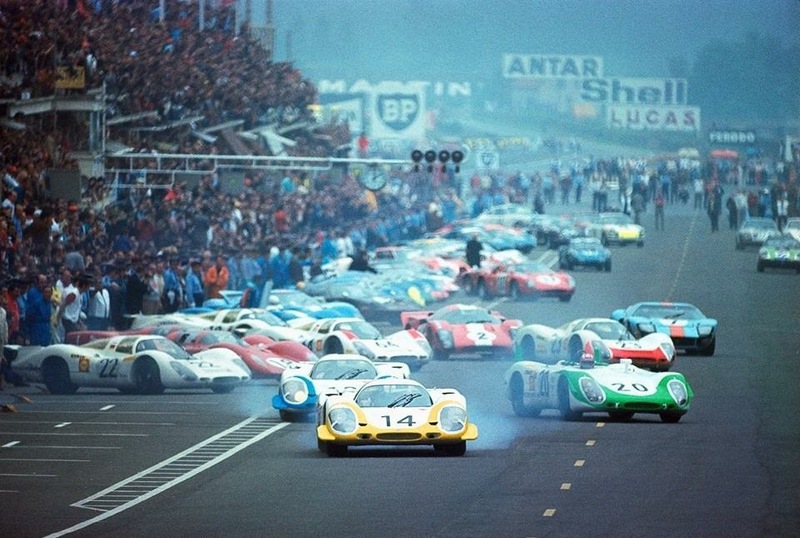 For 1970/1971 Porsche changed their approach to racing the cars, the factory continued to develop them but the race organisation was contracted to JW Automotive and Porsche-Salzburg, but those seasons of success are another story- the seeds of dominance were sown in 1969.